Jim Karpen takes an in-depth look at all the cool features of the new iPad Air and iPad mini with Retina display, while David Averbach explores the bigger picture, asking how significant the latest improvements are, whether readers should upgrade, and what model iPad they should buy. Alex Cequea continues his mission to help readers harness the full powers of their amazing iPhones and iPads. This month Alex covers enabling an Emoji keyboard, using AirPlay, setting up LED flashlight alerts, mastering the Camera app's new Burst Mode, and more. It's a mobile world and General Motors knows it. Daniel W. Rasmus covers GM's efforts to integrate smartphone technology into their cars. Find out how to choose the perfect car (for your iPhone!) and how to make the most of your iPhone-enhanced driving experience. Have you vowed to make 2014 the year you get that big promotion? Rebecca Santiago covers all the apps and accessories you need to rule the office in her humorous guide to becoming a professional. 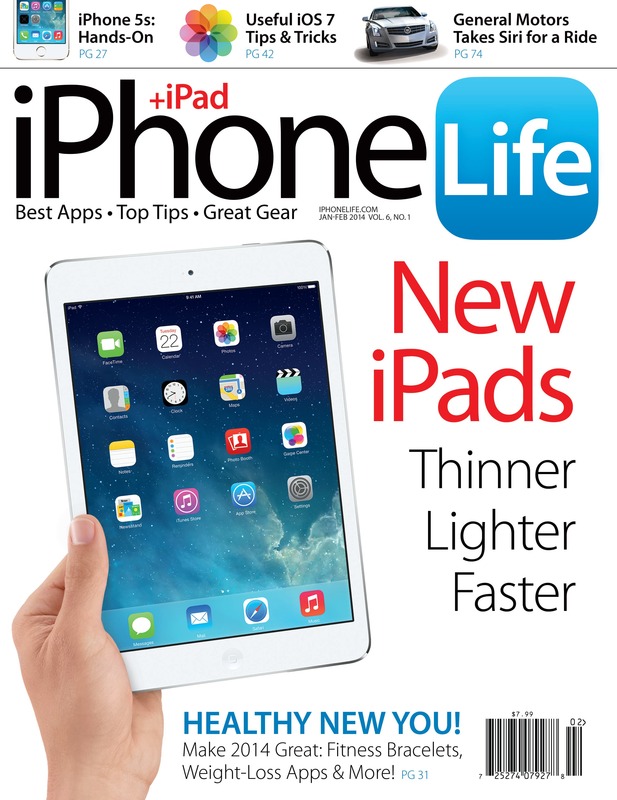 iPhone Life magazine is available at newsstands worldwide, digitally through Apple newsstand and Zinio, and nationally through outlets such as Best Buy, Barnes and Noble, and Walmart. Subscribe today!